Butternut Squash is a known Fall favorite. From delicious soups to spice roasted, the opportunities are endless! I created this dish that can be served as an entrée or as a side dish in the spirit of Fall. With the holidays coming up, this is a great dish to take to Friendsgiving or your family gathering. The good in this? 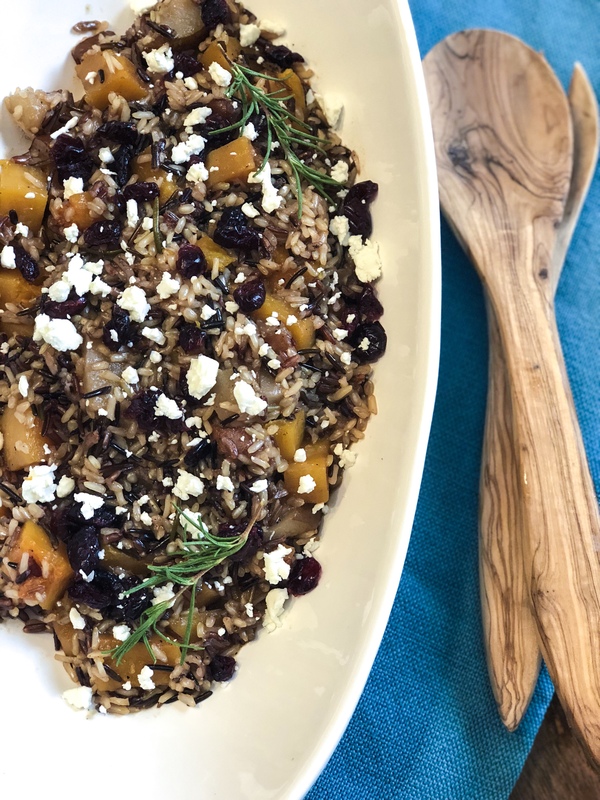 With using wild rice, you get 45 g of whole grain per serving! Whole grains have been shown to decrease inflammation and are ecologically friendly. Heat large skillet or Dutch oven medium high heat. Add olive oil and sauté garlic and onions for about 5 minutes. Add rice and rosemary to skillet along with salt and pepper, Cook an additional 3 minutes. Add vegetable broth and bring to a boil. Reduce heat and cover with lid. Simmer for 45 minutes or until liquid is absorbed and rice is light and fluffy. If needed, add more broth/water to get rice to desired texture. Top finished pilaf with feta and dried cranberries, if desired. Dish can be served warm or chilled.